Ahh, I’m going to see Beyoncé at Vector Arena tonight! I’m beyond super excited for it. 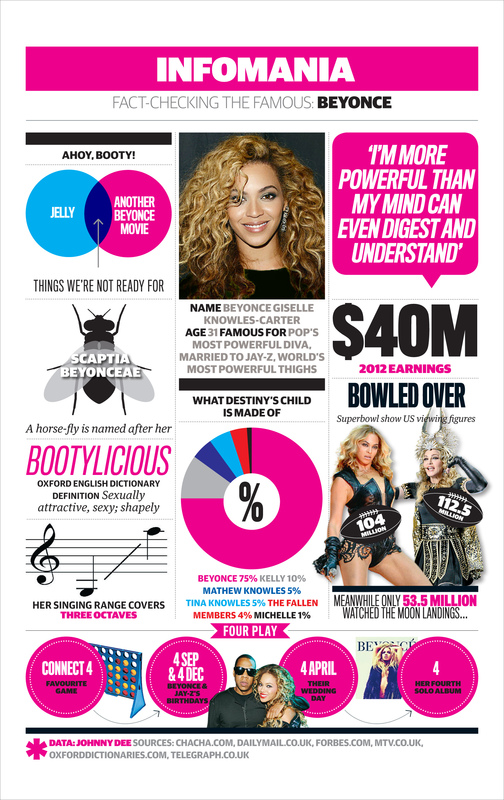 So to celebrate, here’s a fun Beyoncé infographic put together by The Guardian earlier this year. Does Beyoncé seem to take herself a little too seriously sometimes? Yeah, but I guess if my name and image was a million dollar industry, I’d probably be a little serious too. I love the Guardian’s approach to this – it’s very tongue in cheek, very British. Bonus image: a breakdown of the Single Ladies dance. I thought this was really clever, because it’s INSTANTLY recognisable, despite the fact there’s no text on the image at all. The directional lines are awesome, they really do bring movement to the static image. And in fabulous instructional design form, I can tell exactly what movement is required by the diagram. Bravo! Great news, En Vogue! Since 1992, we’ve actually built pretty robust computers that can do just that! I really enjoyed this video that looks inside the math of dating, take a peek for yourself this weekend. For the past week, Amy Webb has been inspiring people to calculate their own algorithm for love. Her laugh-out-loud TED Talk, about reverse engineering her online dating profile and, essentially, data-ing her way into her perfect relationship has gotten a lot of attention, including on The Frisky and Pop Sugar. As Webb’s talk continues to take off online, here is what to watch next if her talk intrigued you and left you wanting more. Love: it makes the world go ‘round, and has been found in 170 societies. But why? In this talk, Helen Fisher shares how she and her team put new couples, longterm couples and those who’ve just been dumped in MRIs, and what they’ve learned about our need for love based on this brain activity. It’s local election time in Auckland, but according to the NZ Herald, only 12% of Aucklanders have sent back their voting papers, which is really such a pity. Not only are we lucky to live in a democracy, we’re extra lucky to have a voting system that’s so easy to accommodate – all you need to do is tick some boxes then pop your voting paper in the post! So this has gotten me thinking. Why don’t we vote? I think it’s too easy to just write it off as a mass of apathetic citizens… in fact, I’m starting to wonder if part of the problem is that not everyone understands civics and how our city is run. I’m not sure if it’s taught in schools. I only know the very basics myself, which I’ve picked up from here and there as an adult. So when I came across this great little video about local elections and why it’s important to vote, I just had to share! 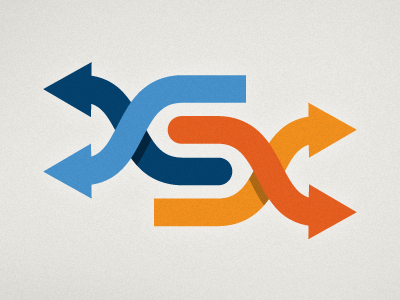 From an instructional design point of view, this is a very simple concept that would be easy to replicate in powerpoint or in Flash if you were so inclined. I found it engaging – moreso than if I had switched onto the 6 o’clock news and saw this as an opinion piece. It’s so easy for political issues, big and small, to become bogged down in detail, and become less accessible to the everyman, that I found this truly refreshing. Well done, Matai Media and 60s Civics! PS: 60s Civics actually have a series of great videos that serve as introductions to government processes and structures (civics, a term not used all that often in NZ), a great starting point if you want to bone up on local government. I had never heard the idea of music played on ‘shuffle’ until I owned my first ipod in 2004. The thought that I could import every single CD I owned into iTunes then set my music to shuffle so I’d effectively have my own personal jukebox was a revelation. To boot, I could make my own playlists which would kind of act like my own personal radio station, playing music of a particular genre at random, without pesky ads or DJs. I was hooked, and so were millions of others who purchased iPods in the past ten years. As a mass we managed to create ‘shuffle culture’. The way people were listening to music actually changed, and this change was created entirely by Apple. Almost a decade later and I’m still a proud owner of several Apple devices (though I don’t think I qualify as a fangirl), but I’m starting to find shuffle kind of annoying. It seems that some playlists play the same set of tunes repeatedly, even when shuffling a thousand songs or more at a time. The frustration at this got me thinking about great albums that I love but haven’t listened to in long form for years. So I started listening to music by the album recently – and it’s wonderful! Albums have become so much more interesting to me than the parts of the sum I had been listening to on shuffle. How does this relate to instructional design? It doesn’t, not really, except it did get me thinking about how learning and especially instructional design at times seems to focus on producing small bites of information to be consumed ‘on the run’, in between work commitments and busy lives. This is all well and good, and I’m sure learners appreciate it, but are we at risk of losing the greater lesson or message of the work in the desperate need to keep learning brief and in morsel form? Just a thought.